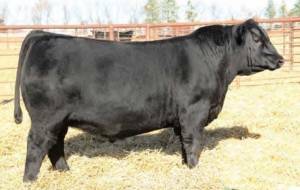 This great $20,000 bull is bred to make a lasting contribution in all traits of magnitude and backed by one of the strongest and most proven maternal generations of elite path finders and has a track record second to none. She has 13 daughters featured in the SAV herd and 39 progeny featured in past SAV sales. She is the favorite cow of Bob Watkins, Kelly Schaff’s right hand man. Her progeny include some of the heaviest 205 day weights in several of their sales. PATRON HAS HELD HIS FLESH AND STAYED FATTER THAN ABOUT ANY YEARLING BULL WE HAVE USED. There isn’t one thing you won’t like about this bull. I picked this bull as one of the top bulls that I liked in the famous Schaff Angus Valley Sale.